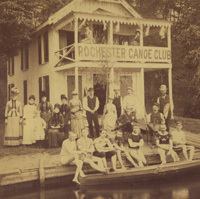 Rochester Canoe Club: A short history. 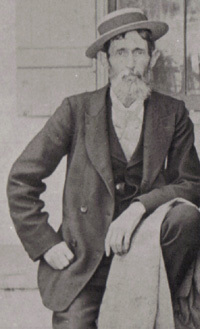 George Henry Harris, manager of the Reynolds Arcade, had the idea for a canoe club in 1881, which led to a constitution and seven members in 1882. The club's first activity was a four day cruise on the Genesee River, but major interest soon turned to paddling and sailing canoe races as defined by the American Canoe Association1 formed in 1880. Eventually, only sailing survived at the Canoe Club without canoes, but its historic name remains in what is now Rochester's oldest continuous sailing club. 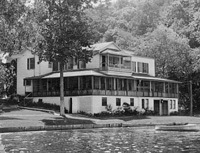 The first clubhouse was built in 1884 on Irondequoit Bay just south of where the Rte.104 bridge is now, on leased land owned by William Sours, owner of Newport House, who became a member. In that year, Frank Andrews became first club champion with a decked sailing canoe Sofronia built by tugboat Captain George Ruggles. Ruggles built a fleet of 7 ACA class sailing canoes for the club in 1886, and went on to become a world renowned builder of the fastest racing canoes. Canoes of this class were nominally 16 ft. long, 30 in. wide with two masts, a centerboard, rudder, and a sliding hiking seat that extended outboard. 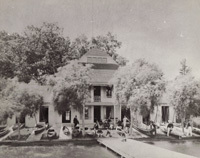 After a merger with the adjacent Remus Club, a larger clubhouse was built in 1887 just north of the first to accommodate 32 members and store up to 40 canoes. It cost $2,000, and again was built by Sours. This building was 40 by 60 ft. with special wings to house all the boats when not in use. The club maintained a steward and served meals year round. On the second floor was a smoking and cardroom with a fireplace, and separate dormitories for men and women with showers and toilets. Running water came from a spring. Winter activities included ice boating and skating. At the turn of the century, membership was 55 with a limit of 60. An 1891 picture shows many boats of all types and the 30 ft. war canoe Huff built by Ruggles that year. Also equipped with sails, it was taken on cruises and to ACA regattas. 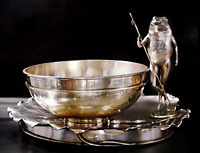 He also donated the Huff Trophy, a large bowl and frog which remains in the club today. The frog was the symbol of the club. Across the bay was the Irondequoit Canoe Club with 20 members dating from 1895 at the foot of Inspiration Point, reachable by boat from Newport House. In 1903, the Rochester and Irondequoit clubs were joint sponsors of the ACA Central Division meet held on the bay. At that time, C.Fred Wolters, purser of RCC was Commodore of ACA, a first for the club in a national post. The program included a 4 1/2 mile sailing canoe race, and 1/2 mile single and tandem paddling events, and a tilting2 contest. Further south on the west side was the Sawennishat Canoe Club, whose members also participated in ACA activities. Before 1910 there were at least 23 clubs on the bay of all kinds involving boating, hunting, fishing, or just social activities, of which RCC is the sole survivor. Sailing canoe races declined at the club; there were canoes, but the decked sailing canoe had become over-developed requiring a high degree of skill and athletic ability to sail well. The club's regattas evolved into more general canoeing, water sports, and dancing parties. However, others in the club, on the bay, and elsewhere were interested in organized small boat racing, and various dinghy designs started to appear in 12, 14, and 16 feet sizes around Lake Ontario. 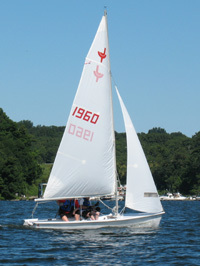 The boat that became significant to the Canoe Club was the Lark, which started at Sodus Bay YC around 1903. This was a low gaff-rigged cat boat, like a scow, 16 feet long by 6 feet beam, and 6 inch freeboard, designed by C.M.Palmer. 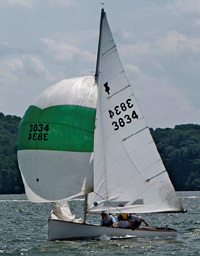 Fifteen were built by E.Gerry Emmons at a cost of about $90, and drawn by lot for their new owners at SBYC. Regular Lark racing started there in 1904 with no more than 2 in a boat. No ballast was allowed, nor any change in size, shape, material, weight of hull, or position of rudder, centerboard, sail, or spars. Larks were raced at RCC until 1953; the last Lark left in 1971. In 1903, the Irondequoit Yacht Association appeared on the bay, holding sailboat races on Sundays at Point Pleasant and later at Newport Point near RCC. William Sours donated the prizes, and Harry Stewart of RCC became secretary-treasurer. After the 2nd clubhouse burned, RCC bought its present site and 3rd clubhouse in 1914 for $4550 from the Irondequoit Land and Improvement Co., Hiram Edgerton, President, who was also Rochester's Mayor. Edgerton had built a large summer residence which was occupied since 1903 by the Sawennishat CC whose members were also stockholders of the Improvement Company. 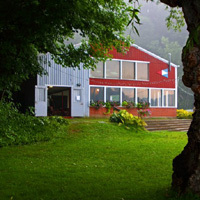 For RCC, it provided boat storage, kitchen and dining facilities, and about 12 rooms which were rented to members, and about 196 ft. of shoreline. 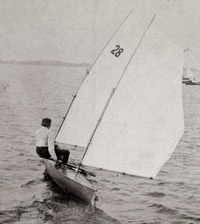 Around this time the Sailing Dinghy entered the club; this was a 12 ft. catboat for one or two persons similar to the Canadian Dinghy, but locally built. In the 1930's, the Comet, a 16 ft. 2 person sloop, and the 15 ft. K-Boat, a locally built 2 person sloop also entered, and with the Lark constituted four fleets that survived into the 1950's. Besides sailing with the Larks of Irondequoit CC in the 1930's, RCC also had races with the Comets of the Algonquin YC. Membership was held to 35 up to 1940, which was felt to be optimum for the facilities with around 31 boats which were moored in the cove or hauled out on the shore. The war years 1941-45 saw a drastic decline. There were 15 members in 1943 with 16 boats, and the budget listed income of $542 with $635 of expenses, and $924 in the bank. After the war, the old fleets only had a few boats each, and there were many other kinds of boats which raced with a handicap, or were just used for daysailing. These included the Lightning, Snipe, International 14, Robin, and Alden O Boat. 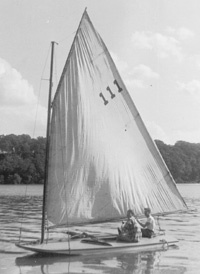 By 1951, membership had climbed back to 26, and interest was building in the Thistle, a fast three person 17 ft. molded plywood sloop with a spinnaker that already had local fleets at Canandaigua, Seneca, Fair Haven, and Conesus. It was designed by Gordon (Sandy) Douglass in 1945, based on the International 14. The first three Thistles were bought by Charles Angle (320), David Allyn (212), and Marsden Tuthill (477) in 1950-51, who became charter members of Fleet 46 in 1952. That year started with 7 and ended with 12 Thistles and 41 members. A novel annual Labor Day Brown Jug Race started that year open to sailboats from the Algonquin and Newport clubs and RCC, and later to all small sailboats on the bay. There was no handicap, and all 7 Thistles beat 24 other boats. The event was named for an old molasses jug donated as a trophy by Commodore Dorr Phillips' mother. Junior sailing programs were also started in Prams in 1953, and again in 1993 in Optimist Dinghies. RCC ran the first Great Lakes Thistle Championship in 1955, and the 1976 Nationals at Association Island. By 1955, there were 21 Thistles and 10 other boats with 64 regular members, and only Thistles were being actively raced. The old clubhouse floors were tilted according to some recollections, due to foundation damage from storm water overflow in the 1930's after new roads were built at the top of the hill. The third clubhouse was torn down in 1957 due to rising concerns about vandalism, fire hazard, and deterioration, and replaced by the present steel building on an adjacent site carved out of the hillside. 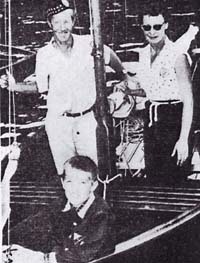 Club members did most of the interior work in 1958 and installed the first boat hoist. A large concrete block patio was laid later on the building's east side. Additional shoreline property was purchased in 1957 and 1965, adding 180 ft. to the north and 58 ft. to the south, completing the present property. Violent storms and high water in 1973 caused severe flood damage to the club's waterfront, which required major reconstruction with a $45,000 disaster loan. A steel sheet bulkhead was built, the hoist pad enlarged with a new crane and motor, and the septic system and roadway repaired. Around 1958, several fathers got interested in starting a sailing fleet for the youth of the club, and built or bought several Penguins, a 12 ft. catboat normally raced with two or easily daysailed by one. This fleet expanded from 3 in 1960 to a peak of 12 in 1962, and were regularly raced with their own start, but declined rapidly after the first 3 Sunfish came in 1964. 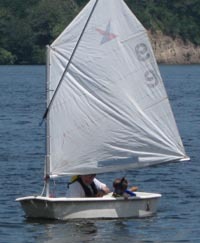 Wayne McKusick, Thistle sailor and Penguin Fleet organizer, became the first Sunfish Fleet Captain. A primary reason for the Penguin's demise was that it wasn't self-rescuing like the Sunfish. The Sunfish Fleet filled the void and grew to 18 by 1971 plus 9 owned as a second boat by Thistle sailors and also 3 Sailfish. By 1971, the Thistle Fleet reached its peak of 45 boats, second largest in the U.S., and membership approached 100, an all time high which was the limit of club facilities. There were 11 other one of a kind boats out of a total of 86 boats in 1971. In 1974 a policy was adopted by the board of governors to restrict the club to Thistles and Sunfish, and to consider only new members who own or crew in those boats and intend to actively participate in the racing program. The following years saw a steady decline to 19 Thistles and 59 active members in 1995, while the Sunfish increased to 29 plus 9 second boats. A Tech Dinghy and a Butterfly scow remained under a grandfather privilege. 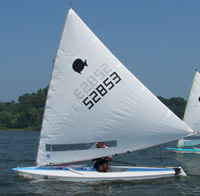 In 1995, Commodore Frank Colgan, a former Thistle and now Sunfish sailor, and two long-term Thistle sailors, Gary Fritz and Neil Armstrong, became interested in starting a two person boat fleet. They selected the JY15, a 15 ft. all plastic self-bailing sloop designed in 1989 with an expanding national class. After narrow approval (6-5) by the board of governors, 7 new boats were purchased at once in 1996, and Fleet 77 was chartered. As George Harris said in a toast at the December 14, 1886 banquet, " Our club as it was, as it is, and as it will be". Right on, George, for another century. Awarded today for best performance of a Thistle sailor at a series of away regattas, and used as a punch bowl on club opening and closing days. The American Canoe Association is organized into various activity committees. The ACA's National Sailing Committee represents the interests that RCC had during its sailing canoe days. A tilting contest pits two canoes against each other. The crew of each canoe attempts to capsize their opponent by thusting and parrying with their paddle. Copyright 2009, Rochester Canoe Club, All rights reserved.